SANSON,N./ MARIETTE,P. - Bayern Baviere..
Bayern Baviere.. - SANSON,N./ MARIETTE,P. Map maker : SANSON,N./ MARIETTE,P.. Size : 16.5 x 16.4 inches. / 41.9 x 41.6 cm. 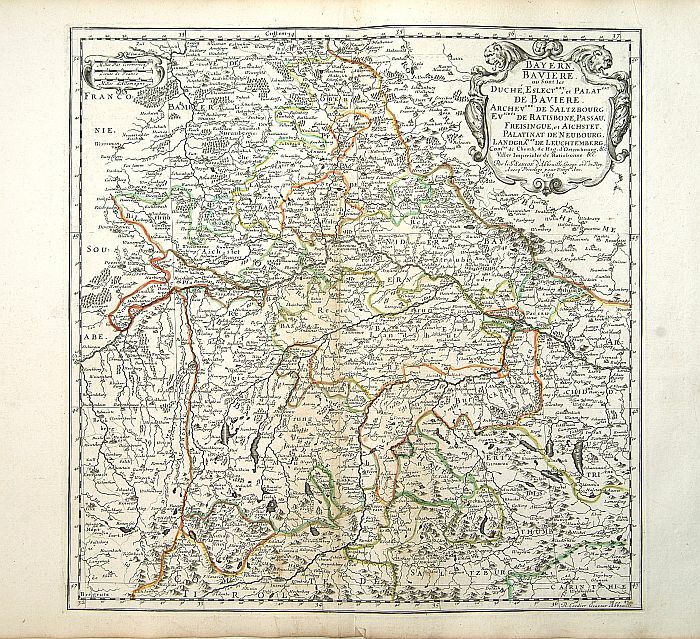 Description :"Covering southern part of Germany, centered on Regensburg, Augsburg, Munich, etc. Engraved by R.Cordier Abbauil. In 1657 Pierre Marriette died, however his son, also named Pierre, co-published ""Les Cartes Générales de toutes les parties du Monde."" the following year. It was the first folio French produced world atlas." Condition : Good and dark impression. Paper little age-toned. Generally in very good condition.